There are so many reasons to be excited about the upcoming Ghostbusters film that I have a hard time narrowing it down to just one thing. An all-female team? Made up of some of the best comedians in the game? 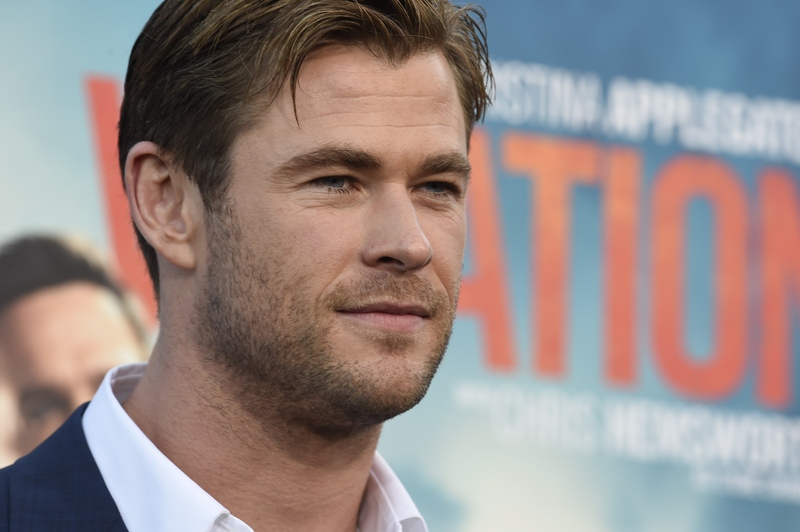 Chris Hemsworth as a receptionist? Someone hold me, because I might swoon from how perfect this film is. As if seeing the new Ghostbusters uniform, and the actresses themselves on set, wasn't enough, we've caught a new behind-the-scenes look that has me fanning myself and waiting impatiently for the movie released date. This photo of Chris Hemsworth on the Ghostbusters set is going to make you put this film on your to-watch list if it wasn't already on there, because he looks no less heroic dressed as the Ghostbusters' receptionist as he does dressed as Thor. Yes, even without those biceps on display. Maybe I've been watching one too many Thor films, but the glasses that Kevin is wearing give me a definite Clark Kent type of vibe. I don't think he's just your ordinary receptionist. Sure, they could be a nod to secretary Janine Melnitz from the original films, who also wore glasses, but I don't think that's it. Or, at least, I don't think that's all there is. What if he is the Clark Kent of this world? What if he's a retired Ghostbuster himself, and the glasses help him look harmless and retired? Clearly, the bike is indicative of the fact that Kevin is going to be where the action is. He's no ordinary receptionist, and he's no ordinary love interest. If the girls need help, he's going to ride right into the maw of the spiritual beast to give them the distraction that they need to save the day. His bike seems to have equipment attached to the back of it, so he might be playing more of a support role than just answering calls. Further proof that Hemsworth won't be staying behind a desk all day is his uniform. This could either tie into my theory that he's a retired Ghostbuster, who already had his own uniform fitted to his dimensions and could whip it out on command, or my other theory that he is an honorary support member of the team and thus has his own uniform in case he needs to hit the field to replenish their equipment. Either way, the uniform is not exactly receptionist chic. Sorry, what was I talking about? Oh, right. That smile. Besides turning anyone with eyes into a pile of goop, that smile seems to suggest that Kevin really loves what he's doing — riding a bike likely into danger — which says something about his personality. Either he's very brave, very dim-witted, or a huge thrill seeker. Or, hey, maybe he's all three. Who am I to judge a man that smiles like that? I have no theories about the hair. I just think that Hemsworth is further proving that he can rock any hairstyle. We'll have to wait until more details about the film come to light before we can truly know what real role Kevin is going to play in all of this, but one thing is for sure: adding Hemsworth to this movie was a great choice.